Kids and Juniors will love the CRAZY DREAM quad skate with cool boot colours and Gyro LIGHT-UP Wheels! 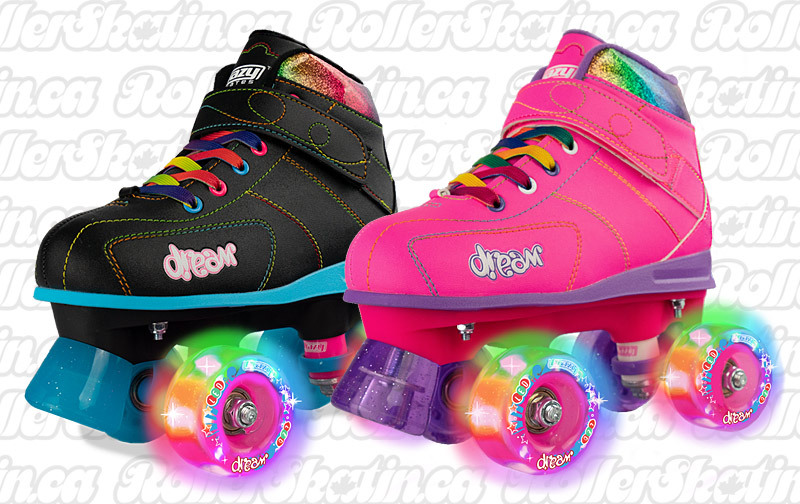 CRAZY DREAM RollerSkates with Light-Up Wheels! Kids and Juniors will love the CRAZY DREAM quad skate with cool boot colours and Gyro LIGHT-UP Wheels! Built Aussie-tough, the CRAZY Dream skate uses a reverse kingpin to make adjustments simple. Comes complete with a light and durable Nylon plate, non-marking rubber toestops and 4 Light-Up wheels/4 regular wheels – that can be used for both indoor and outdoor skating, installed with ABEC-1 8mm full precision bearings. Choose either Pink or Black in available sizes in the pull-down menu.